Well if you are going to be picking on people for their poor spelling, I would suggest spelling words correctly yourself. Isle (n.) – An island. Aisle (n.) – …3. A passageway for inside traffic, as in a department store, warehouse, or supermarket. I hate people that post simply to correct spelling and/or grammar, but irritates me even more when the person that is correcting an error makes a similar error. leprechaunman67 for the flawless victory! I’ve always wanted to do this. 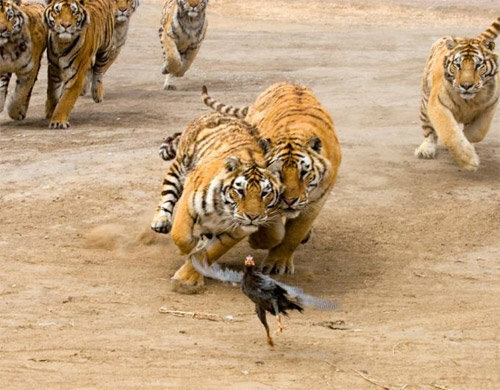 Its basically only in zoos in asia where you get to drive up to the tigers and pay money to throw out a chicken. And if you pay alot, they will unload a cow for you! thatz one intense game of follow the leader….. So this is a sport? That’s disgusting. So it’s ok in nature, but not in captivity, Is it wrong simply because we are facilitating this act of cruelty? It’s not sport so much as a spectacle. I would find it funny until the tigers actually caught it. Then I would feel bad.